The Beije family found a quaint villa in a superb location on a half hectare plot, on the edge of the forest. The location and plot are outstanding featuring high biodiversity, mature trees and a wonderful garden. But the original house design left some to be desired. The small windows, poor energy performance and outdated design inspired the family to go for a rigorous renovation. Together with the family we developed the concept. We boosted performance in energy (from label F to A), water, heat and thermal comfort. The result is a bespoke and subtle design, suitable to the environment. Partially self-constructed, we stood by the family in various stages of the project. 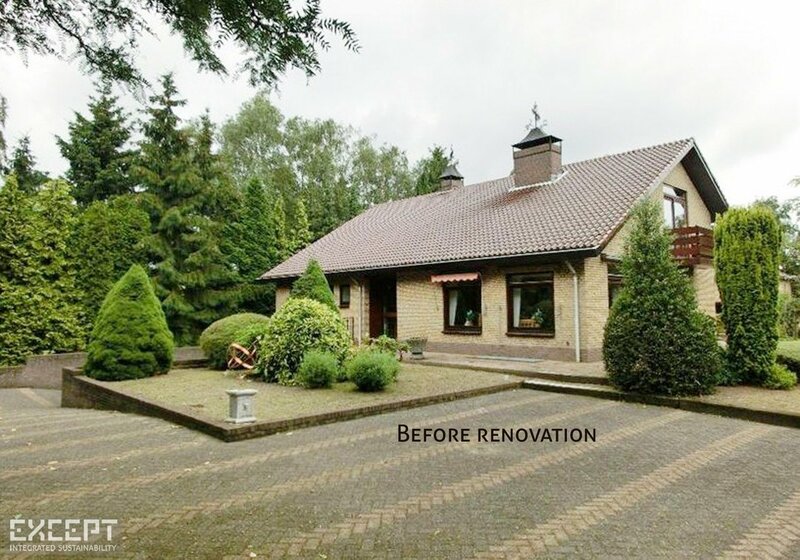 The renovation plan preserves the main structure of the house, and enlarges the windows. It clears space inside for a spacious and lofty living, with open kitchen. A typical design feature of the old house, the asymmetrical roof, is preserved. It introduces a wide dormer living-window on the top floor, facing south, creating a whole new living space. 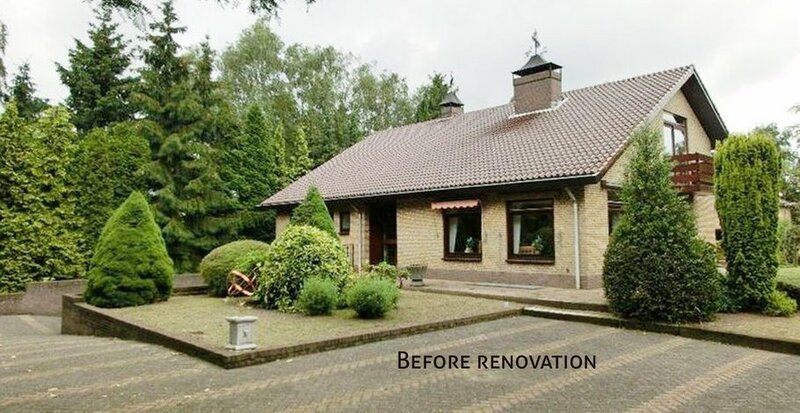 The basement and attic are reformatted for livability, improving the performance per square meter of the house. This also improves its investment value without expensive site works and structural additions. An example of circular re-design, the house reuses most of its old materials, minimizing waste, and introduces local, conscious and re-usable materials. The design uses natural and local materials in a new cladding system around the house. This boosts its insulation performance sufficiently for it to become energy neutral. The wood is a carefully chosen special teak variety, able to withstand the climate, and low on maintenance. The wood is locally sourced and FSC certified. It comes from the inspiring and exemplary family operated wood manufacturer Wytske's Houthandel. Additional exterior insulation is achieved with mineral-based Multipor. This is recyclable, toxin free, with low embedded energy and locally produced. 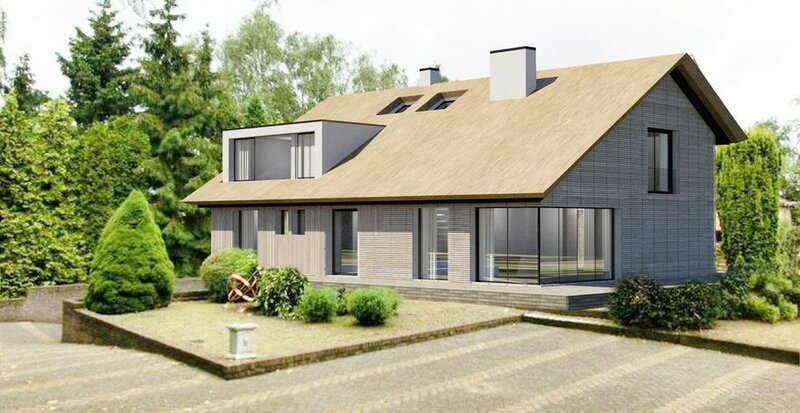 The roof is clad with a traditional material: Straw. Straw has been used for centiries in the Netherlands, is completely natural and has a high insulation value. The internal insulation is from sheep wool. 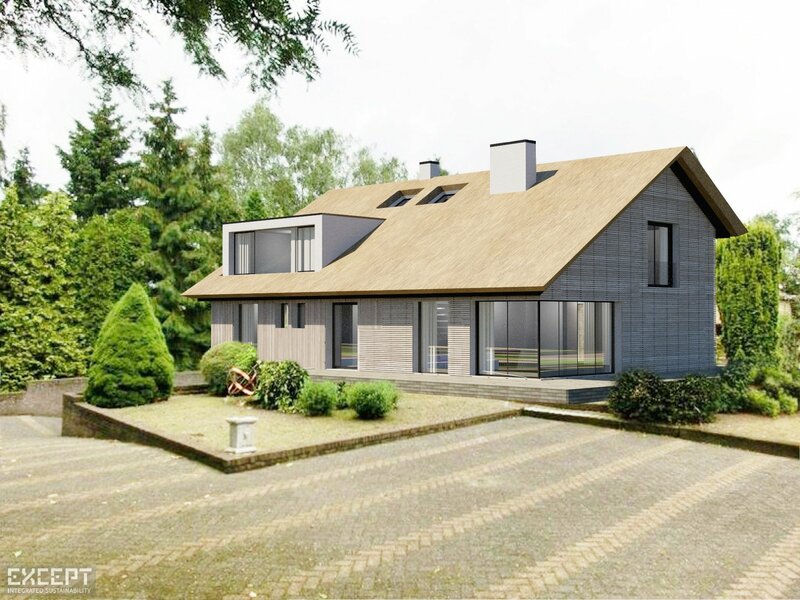 Another notable supplier that boosts the house's performance is the eco-aware construction material market GroeneBouwMaterialen.nl. The electricity is powered by solar panels on a garage structure on-site. The sun and a ground coupled heating system delivers heat, with seasonal heat storage, powered by the solar panels. Heat is delivered through a high performance floor heating system from Climalevel. The wood-fired central hearth uses locally sourced wood. While not necessary to maintain temperatures, the hearth brings life and fun to the house. It also feeds into the heat recovery system for ventilation, making extra use of its energy. The ventilation air is pre-conditoned through an earth-duct, and delivered on a demand-basis, with heat recovery. The water design is unique, utilizing ecosystem services of the location. The house collects rain water which is used for grey water uses such as toilet flushing and garden irrigation. The majority of the rain water is ground-infiltrated, and thereby filtered. A pulse pump retrieves the water from deeper layers, delivering quality drinking water to the house, making it water-neutral. The Beije family opted to self-construct part of the renovation. This is a large cost saver for them, as well as an unforgettable life experience. While a challenging process, it allows them to get into the nitty-gritty of all the aspects of the design. In this process they become the master of their own environment. The rest of the project is executed with a local construction company, sustainability aware Hijnekamp from Rhenen. We applaud and salute the family's energy and vision for this amazing villa. We wish them many decades of joy from their unique and exemplary house.